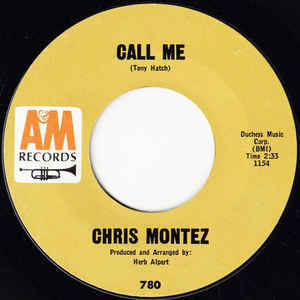 1) Chris Montez sings that you can always call him, regardless of the hour. Do you believe that it's ever too late to phone someone? Yes, unless there has been a death or an emergency, I have always been taught not to call people after 9-10 at night, but it depends on the person too. I have called my mom at 11:00 at night before because I knew she was up and I have also called my cousin and she has called me really late, but non family....no. I also have a co-worker that goes to bed at 8:30. 4) Chris Montez is a graduate of El Camino College in Torrance, California. The average daytime temperature in November in Torrance is 70º. How is the weather where you are today? It was in the 60's today, but we are expecting thunderstorms. 5) Today Chris actively promotes a healthy lifestyle to children. He was honored for his efforts by the group SOPA (Stop Obesity, Promote Activity). Do you believe you get enough exercise? No, I need to walk on my treadmill. 7) In 1966, when this was playing on juke boxes, kids were watching Batman and Star Trek. If you had your choice of watching an episode right now, which would you choose: Star Trek or Batman? the tv shows... neither, but I do love the Batman movies. 8) Also in 1966, celebrity chef Gordon Ramsay was born. Do you enjoy cooking? not really. Wow Lori! The head in the Lion's mouth? LOL! I would rather be a Ring Master then either of those two. I too did the Saturday 9. Have a blessed weekend my friend. Enjoy your warmer weather today! I envy your warmer weather. I thought 28 degrees felt warm. We both chose the lion's mouth! Different questions this week! Have a good weekend! I don't think I want to do either of those things unless the lion has no teeth. And even then, I don't think I,could handle all that slobber! Still, it would be better than being shot out of the cannon! Well, aren't you the brave gal, putting your head in a lion's mouth. :o)) Have a great weekend! When my kids were small I had a friend who would wait until her kids were asleep to call my house. Of course she would wake my kids up in doing so. Not a big cooking fan here, either, but somebody's gotta do it.